Okay, so those last few acronyms aren’t entirely accurate. ;) That being said, thanks to Bryan (again! ;) for making me aware of another spacey game that has a Kickstarter campaign. 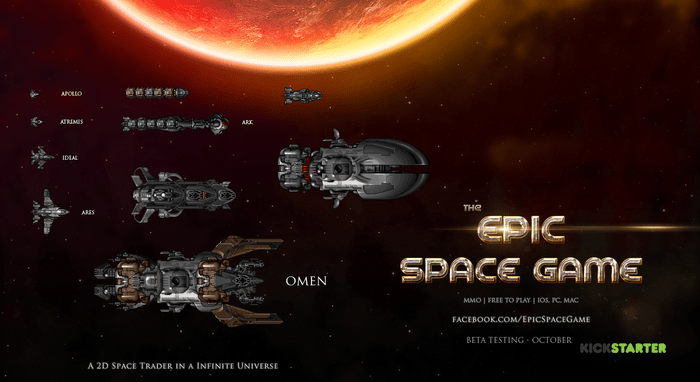 This time it’s a Free-to-Play (F2P) Massively Multiplayer Online (MMO) space trading and combat game called The Epic Space Game (love that title, it’s like Snakes on a Plane in its bluntness). It claims to have an ever-expanding universe, player owned stations, a wide variety of objectives and so on. It looks pretty nifty, so go check ’em out and, if you like, kick ’em a few bucks. Enjoy! Backed it about a week or two ago, didn’t think of telling you. Sadly, this looks like it’s going to fail, probably because the kikstarter isn’t very good. Welcome to the blog Luringen, and I hope you’re wrong, honestly, but we’ll see! It’s not the first time I’ve posted her- wait, oops i used my username instead of real name… Sorry for the confusion! space trading. player owned stations. this sounds like something i could get into. Next story Startopia Now on GOG! Previous story New Hardware Rave: Freespace 2 Looks F%#*ing AMAZING!